I love reading massive story lines that span over multiple titles. I signed on for Civil War even though there were multiple ongoing series and tie-in issues. When Final Crisis came out I faithfully purchased the mini-series and tie-ins that were involved with that story. The same thing holds true for handfuls of other events that the publishers seem to do every 6 months. I enjoy reading these long, drawn out stories, and I enjoy reading them multiple times. That’s where I run into trouble, it’s very time consuming to pull all the individual issues out of their separate boxes and organize them into proper reading order. That’s why I love trade paperbacks/hardcovers so much, the ease of a complete story in one format. But, like anything nowadays even the trades and hardcovers are costing a pretty penny, so what can you do? Now, Jason Newcomb already talked about how eBay was a good tool for getting back issues of your wanted titles. But, I haven’t seen Amazon mentioned as a place to get cheap TPBs/HCs. With the way single issues of comics have risen in price it makes it difficult to pick up every issue of a certain event, the alternative for that is picking up the collected editions of stories when they are released. But, even those seem to have taken a spike in price in recent years. Because of this I offer Amazon as a cheaper alternative to buying them directly from a bookstore or comic shop. I recently had the urge to re-read the latest X-Men stories from the past couple years and rather than digging out all the old back issues and looking up the reading order I decided I’d like to purchase the trades instead. When I looked at my local comic store I was amazed to see the prices running anywhere from $25 to $40 dollars for a single graphic novel. 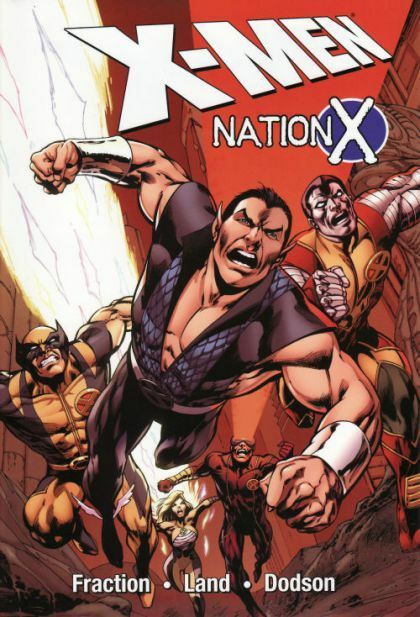 Take Nation X for example, the novel is comprised of Uncanny X-Men 515-522, Dark Reign: The List, X-Men and Nation X 1-4. If you were going to hunt down every issue there, and assuming you paid cover price, you would end up paying about $45 not including tax. Now the hardcover and softcover do give you a break on price being $35 and $30, respectively, but even that is a little too pricey for a lot of budgets. In my search I looked on Amazon to see how much they were charging. They consistently have graphic novels marked down 25% or more. But, even as much help as marking a $35 hardcover down to $26 is, for me it just wasn’t enough. Like eBay, Amazon lets it’s user sell items in what they call the Amazon Marketplace. If you’re looking for for cheap graphic novels take a look at the New & Used section of an item. All of items in there are being sold by Amazon users and you can usually find some pretty good deals. Again, using Nation X as an example I was able to find a copy of the hardcover for sale for about a little less than $10. That’s an amazing deal! Now, some tips on buying from the Amazon Marketplace. If you use Amazon regularly you may know about the Prime account, you pay $79 per year and you get free two day shipping on anything sent by Amazon. Sometimes sellers in the Marketplace send their items to Amazon for shipping. In that case, if you are a Prime member you get free shipping on it. However, if you do not have a Prime account make sure you factor in the shipping fee that is attached to an item, it is usually $3.99. Also, consider the condition of the item. Amazon has 6 different levels of quality for an item: new, like new, very good, good, acceptable, and unacceptable. Make sure the quality of the book is something you can live with, it is your money after all. Lastly, like eBay take a look at the reputation of the seller and make a decision if you want to trust them. I personally have not had any problems buying from an Amazon seller, but everyone’s experiences are different. Well there you have it. I have been able to find some great deals on Amazon just by keeping my eyes open and being patient. Like any online commerce there is some risk involved but if you keep your wits about you, you can mitigate most of that, and Amazon is great at taking care of their customers if there is a problem. Amazon isn’t the only place out there for great deals, but it is another option you can use to save money. I will have to check out the Marketplace, my best places to look for cheap hardcover or trades is Half Price Books where they are litterally half price (or less) and sometimes I get lucky with the Books-A-Million or Books & Co clearance shelves as they have dirt cheap Trades. I got the Dark Phoenix Saga for 5.99 at one Books-a-Million in Cincinatti. Unfortunately Barnes and Noble, the store closes to me never has TPs or HC on clearance. I will definitly give the Amazone Marketplace a go though, thanks for the tip. That’s awesome! Way to bargain shop!